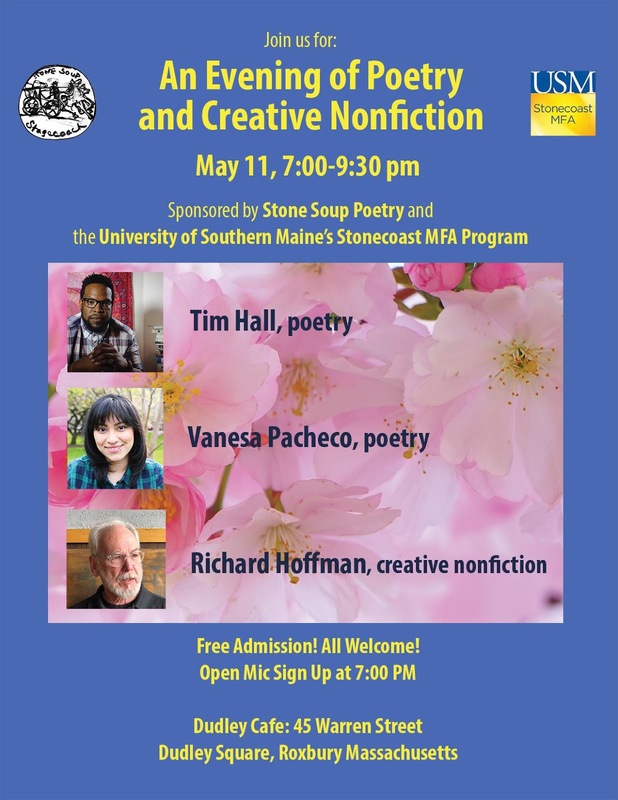 On May 11, Stone Soup Poetry and The University of Southern Maine's Stonecoast MFA Program team up to retun to the Dudley Cafe in Roxbury for another night of poetry and prose iwth open mic included. Readers include Richard Hoffman, Vanesa Pacheco and main feature Tim Hall. 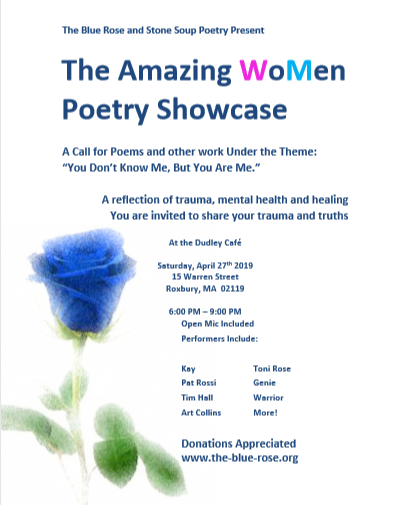 On April 27, Blue Rose and Stone Soup Poetry join together for National Poetry Month to bring you the Amazing WoMen Poetry Showcase. We return to the Dudley Cafe from 6:00 to 9:00 PM for another Saturday night of open mic poetry and featured performances. Poets are invited to present and perform work related to the night's theme: “You don’t know me … but you are me." Join in with our showcase of artists sharing stories of trauma and healing. Doors open at 6:00 PM with the open mic starting at 6:30 PM. Food will be available for purchase at the Dudley Cafe, which we encourage you to support. Stone Soup meets every Thursday from 6:30 to 8:30 on 138 Tremont Street in St. Paul's Cathedral's Lawrence room (past the receptionist area after entering the cathedral on the right-side entrance). On April 18,editor and publisher Jason Wright returns to our podium. Jason Wright is the publisher of Oddball Magazine, where his Jagged thoughts poem column runs every Tuesday. Many of these poems were collected into Jason's first book A Letter to the World. His new book, Train of Thought, is forthcoming from Oddball Publishing. Stone Soup meets every Thursday from 6:30 to 8:30 on 138 Tremont Street in St. Paul's Cathedral's Lawrence room (past the receptionist area after entering the cathedral on the right-side entrance). On April 11, Stone Soup returns for another open mic and the return of Meg Smith, who is celebrating her newest poetry releases. 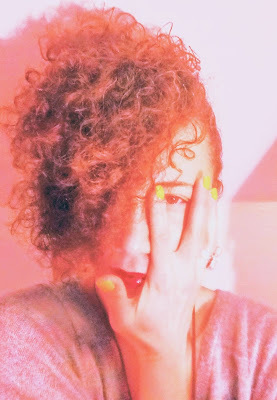 Meg Smith is a poet, writer, journalist, dancer and events producer living in Lowell, Mass. 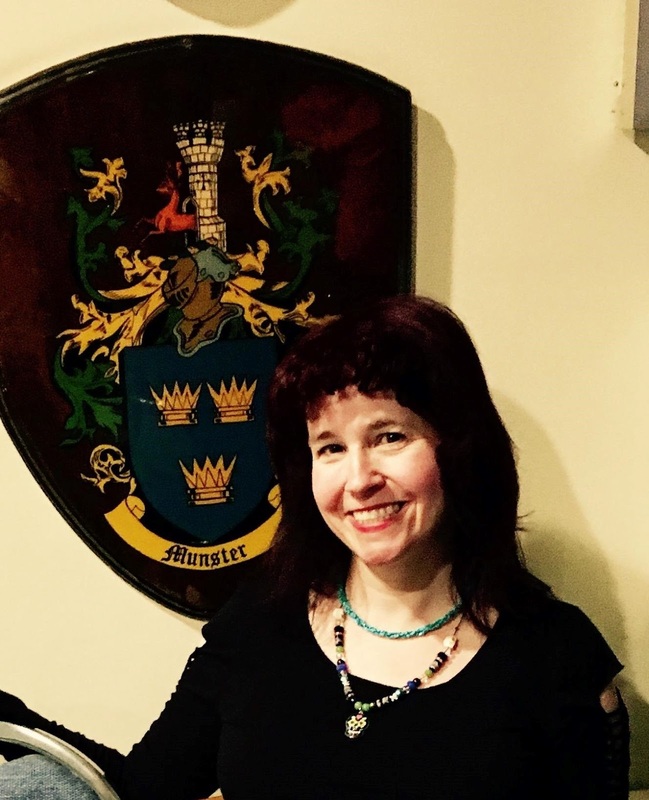 Her poems have appeared in The Cafe Review, Pudding, Poetry Bay, The Horror Zine, Silver Blade, Raven Cage, The Blue Hour Anthology, and many more. Her most recent poetry books, This Scarlet Dancing and Dear Deepest Ghost, are available on Amazon. She is working on a new poetry book, Shadow Island, and is the creator of Midnight Muse fabric arts. She welcomes visits to megsmithwriter.net. Stone Soup meets every Thursday from 6:30 to 8:30 on 138 Tremont Street in St. Paul's Cathedral's Lawrence room (past the receptionist area after entering the cathedral on the right-side entrance). 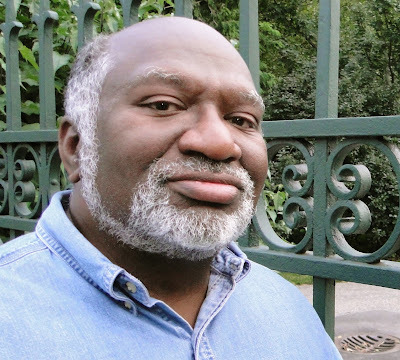 On April 4, Charles Coe makes his long overdue return to our podium and helps us kick off National Poetry Month. 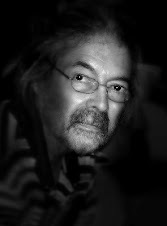 Charles Coe is the author of two books of poetry: All Sins Forgiven: Poems for my Parents and Picnic on the Moon, both published by Leapfrog Press. A third volume, Memento Mori, has just been released by the same publisher. Charles is also the author of Spin Cycles, a novella published by Gemma Media. He was a 2017 Artist-in-Residence for the city of Boston and is an adjunct professor of English at Salve Regina University in Newport, Rhode Island, where he teaches in the MFA program. Stone Soup meets every Thursday from 6:30 to 8:30 on 138 Tremont Street in St. Paul's Cathedral's Lawrence room (past the receptionist area after entering the cathedral on the right-side entrance). On March 28, we welcome poet and open mic regular Laurel Lambert for her first ever full-length feature. Writer and artist Laurel Lambert is the author of the recently published chapbook The Sun Exploded in My Mind, currently available at Brookline Booksmith and elsewhere. In 2009 she was the recipient of the Jack Powers Stone Soup Savor Poetry Prize by Gordon Marshall. Her work has also appeared in Spoonful, Oddball Magazine, Stone's Throw and elsewhere. Stone Soup meets every Thursday from 6:30 to 8:30 on 138 Tremont Street in St. Paul's Cathedral's Lawrence room (past the receptionist area after entering the cathedral on the right-side entrance). 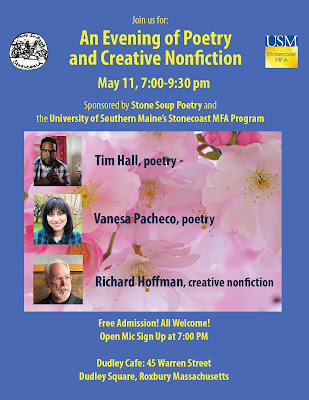 On March 21, Stone Soup returns for another open mic, followed by a poetry workshop. If you want work workshopped, please bring a poem of any form and style no more than 1-2 pages. Bring copies of your poem to share. If you have trouble printing your work, you can email it to chadpoetforhire@yahoo.com by Thursday morning. Stone Soup meets every Thursday from 6:30 to 8:30 on 138 Tremont Street in St. Paul's Cathedral's Lawrence room (past the receptionist area after entering the cathedral on the right-side entrance). On March 14, we welcome poet and musician Liza Zayas, fresh off of finishing her stint as columnist for Oddball Magazine. Liza Zayas is a poet, spoken word artist and singer/songwriter who is also known as Luna del Flor. She has been writing, performing, collaborating with House music producers and vocalists and organizing House music parties with others for over 25 years. She has been a feature performer for International Women's Day and V-Day events, and curates events for Women's liberation as well. Liza was most recently a weekly contributor at Oddball Magazine with her column, Underground Garden, and is currently collaborating with producers and singers for upcoming music. She continues to write with love, mused by life and its many surprises. Update: Laurel Lambert's reading is postponed to illness. All-open mic tonight. Stone Soup meets every Thursday from 6:30 to 8:30 on 138 Tremont Street in St. Paul's Cathedral's Lawrence room (past the receptionist area after entering the cathedral on the right-side entrance). On March 4, we welcome poet and open mic regular Laurel Lambert for her first ever full-length feature. Stone Soup meets every Thursday from 6:30 to 8:30 on 138 Tremont Street in St. Paul's Cathedral's Lawrence room (past the receptionist area after entering the cathedral on the right-side entrance). 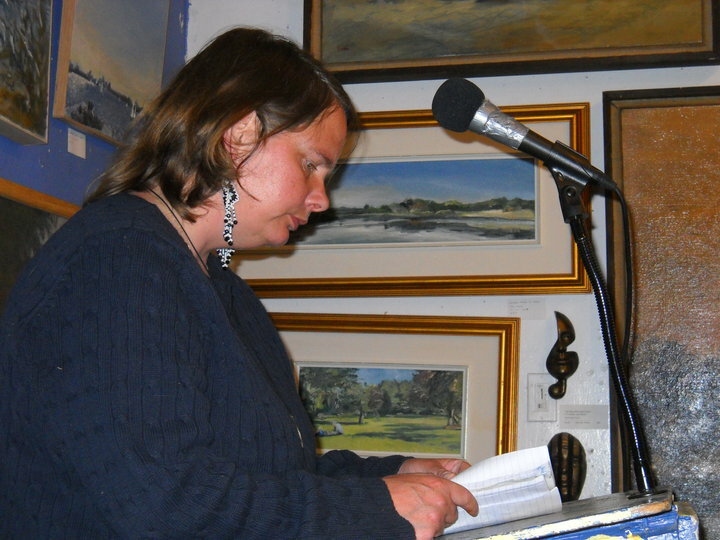 On February 28, Stone Soup returns for another open mic, followed by a poetry workshop. Stone Soup meets every Thursday from 6:30 to 8:30 on 138 Tremont Street in St. Paul's Cathedral's Lawrence room (past the receptionist area after entering the cathedral on the right-side entrance). On February 21, Stone Soup returns for another open mic, followed by a poetry workshop. Stone Soup meets every Thursday from 6:30 to 8:30 on 138 Tremont Street in St. Paul's Cathedral's Lawrence room (past the receptionist area after entering the cathedral on the right-side entrance). 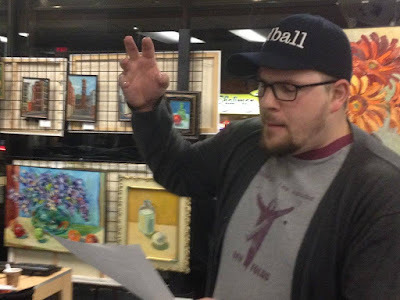 On February 14, Stone Soup returns for another open mic, followed by a poetry workshop.